Spring peepers, bears, raccoons, penguins, arctic animals, baby animals, birds and more! Some of my whiteboard kids' drawing class demonstrations as a 30 page coloring book to download from my Etsy Shop. The printable digital download is $9.95. Yes, if you poke around you can also find it for free (or donation) on my website for awhile. We'll leave that as a puzzle for you to solve though! 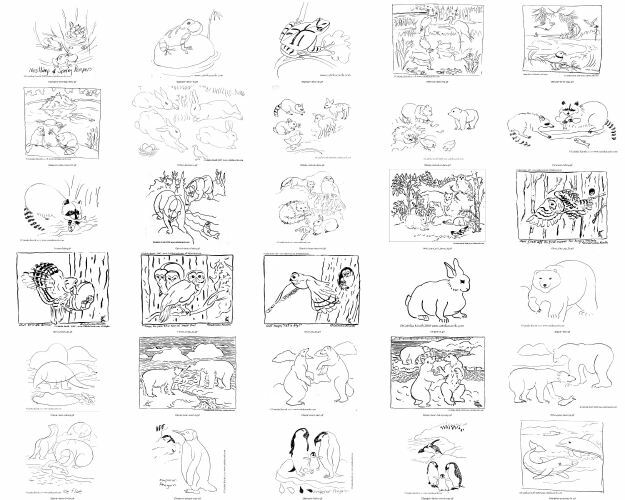 Printable Animal Coloring Book to download. My recent Cat and Star story drawings: Today I worked more on the scene of Cat getting into it's little boat, on the beach, with Star looking on. I've drawn it a few times in pencil. I like to work in my car so I can be out and about while working but it can get awkward. In this case I'd had to use the car window for a lightbox for tracing. When I thought it was ready to ink, I realized I did not want to ink over the pencil drawing. I'd have to try inking while tracing. But that did not work in the car without a proper lightbox. That work session ended up being instead a practice session of drawing freehand repetitions, with brush and ink (black watercolor), of the cat's head. It was good practice though. This version I drew with a croquis pen and black watercolor, 'inking' over the pencil lines. The pencil is not yet erased and ink smudges not cleaned up in the originals. The enlargements got some digital doctoring though. You can download my cat and star drawings for coloring pages! Cat and Star on the beach with the boat - coloring page. Cat and Star play in the surf - coloring page. Cat and Star look at shellfish on the ocean floor - coloring page. Cat and Star in the night sky - coloring page. Make a Mother's Day card from my Mother's Day coloring page.